...the same guy that won last year. 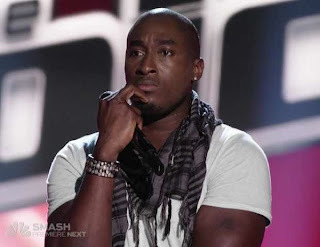 Oh...I mean, Jermaine Paul...who looks and sounds pretty damn similar to last year's winner Javier Colon. How did this happen? The guy is a mess. He cries far too often for a man (more than once a year), all of his big notes sound super forced (I have heard high school students sing I Believe I Can Fly with more ease), and I literally don't remember a single song he sung this season besides the R Kelly hit...and that is because he sang that last night. His 'thing' was that he was Alicia Keys' former backup singer. 'In the shadow and now into the spotlight' kind of story. Great...if he had something better than a backup voice. He is on pitch and sounds nice and everything, but he doesn't have the power that someone, singing the way he does, needs to be a stand out. He is just so-so. So-so results in things like me not remembering any of your other performances. I was so hoping that Juliet Simms was going to win this one. She was the best one on stage tonight and was robbed. I think Jermain's career will tank (I'll put money on it if someone wants to bet) and in a year people will forget who he is...just like they did with Javier. This may be a nail in the coffin of this show. As much as I love watching Christina and Adam fight, Cee Lo and his tiny arms being creepy with the white cat and Blake bringing the Southern charm...if you don't have the talent and you can't lead people to pick the best acts, at the end of the day...your show is a waste of my time. Next year they need to do the following: get rid of Carson Daily, he is brutal; get a handle on the audience, invest in some tazers or something for the screamers; teach your judges time management; and do a better job finding people who can actually sing cause I can't do another season of so-so. Complete waste of an entire season.. He was NOT the best in ANY way.. Frick. As far as I'm concerned,this "contest" was rigged from the start.Simms was a FAR more compelling vocalist/STORY and SHOULD have won.Paul is NOT exceptional,was absolutely BRUTAL on his ROCK numbers and his ballads were overwrought with distractingB.S. which made one LONG for the far superior original.The PURE vocal ability of CHRIS Mann so DWARFED EVERY contestant and his performances along with SIMMS' takes on James Brown,the Police were the true HIGHLIGHTS of this entire season,PERIOD.This smelled like Alicia Keys calling in some "favors",it made the whole affair one big WASTE of TIME and has soured me on the show.Simms,Chris Mann will go on to have significant careers,their stars WILL rise,while Paul will fizzle,NOTHING extraordinary about him and I refuse to believe "AMERICA" embraced him with their voting,he should have been bounced weeks ago.